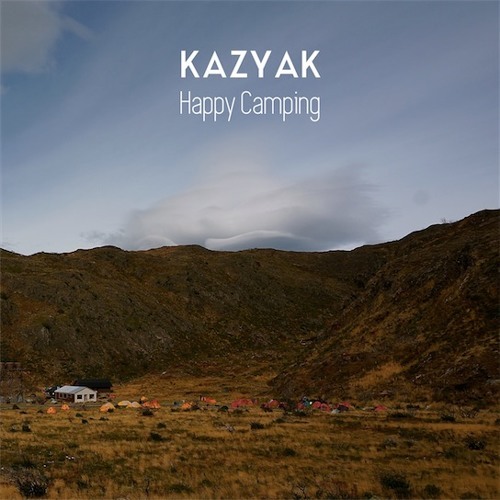 Artist: Kazyak Album: Happy Camping Release date: July 21, 2017 Press contact: bill (at) teamclermont (dot) com In the conventional sense, a happy camper is a comfortable, contented person. Happy Camping is Kazyak having reached this state in active form. “Everything is fine,” says songwriter/guitarist Peter Frey, “With Happy Camping, the band has reached a steady state with sound, lineup, age, and life. Simply, we’ve struck balance. The band is experiencing normalcy at a sustained pace.” With Happy Camping, indie rock band Kazyak has taken a big step beyond picking up the pieces. As we were taken thick into the woods with the See the Forest release, Happy Camping seems the beginning of a great expedition. As Frey says, “It’s after you’ve put your pack on your back and set out walking down an unexplored trail, but before you’ve arrived to the foot of the mountain. This album is the long walk through the open field to the base of the mountain.” The music and inspiration are still deeply grounded in a natural setting, though this time, the forest burned down and this is the first wave of growth – the season is undoubtedly spring, the flowers are growing back, and there is no darkness or hint of death. STYLE/SOUND Kazyak’s sound evokes a type of Experimental Americana. The album is dubbed by Frey as the band’s ‘country record’, using simple guitar/bass/drums orchestration to imitate Gillian Welch and David Rawlings’ ‘slow heartbeat’ approach to feel. The lineup is Frey on nylon/acoustic/electric guitars, long-time friend and bassist Lana Bolin, and drummer/engineer Brett Bullion – who together display a tightness that entwine hooks, lines, and visceral textures. The live lineup of the band adds Andy Wolfe (guitars), Pat Hayes (synth) and Nick Grewe (drums and electronics). INSPIRATION Frey wrote the songs in the months that led up to his wedding. As part of a pre-wedding get-away, he and his wife-to-be visited Alaska, where they helicoptered from the foot of a melting basin to set up camp atop the glacier. The trip marked an inventive approach to making peace with the past, entirely unhooking it from the future ahead. In search of balance and a steady-state, Frey and the band seem to have found it. Download "When I Lived in Carolina"
Users who like "When I Lived in Carolina"
Users who reposted "When I Lived in Carolina"
Playlists containing "When I Lived in Carolina"
More tracks like "When I Lived in Carolina"